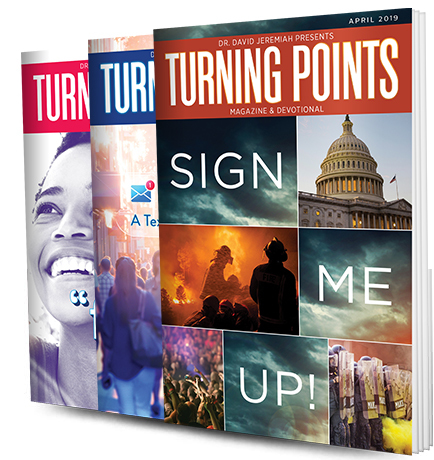 You will receive a free 3-month subscription to Turning Points magazine. With your gift of support you will receive a full 12-month subscription. Your generous support not only enables us to keep producing the devotional magazine you enjoy each month but also helps us deliver God\'s Word through our 8,761 daily radio programs and continue our outreach to 2.9 million people through our weekly television broadcasts. Thank you for requesting your free 3-month subscription to Turning Points magazine. You can receive a full 12-month subscription with a generous gift of support. Your support not only enables us to keep producing the devotional magazine you enjoy each month, but will also help us deliver God\'s Word through our 8,761 daily radio programs and continue our outreach to 2.9 million people through our weekly television broadcasts. We've filled in the address information from your last online donation to Turning Point. If you would like to enter different information, please click the "clear this form" link. This resource is free of charge. However, your generous support is greatly appreciated. Click here if you would like to give a donation to Turning Point. Your gift causes a ripple effect in the worldwide ministry of Turning Point. Sorry, we encountered an error. 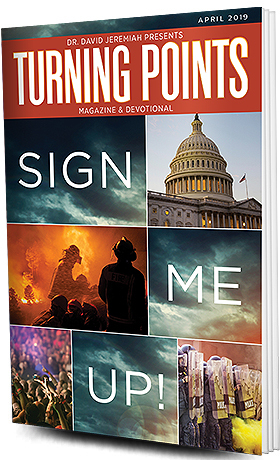 Each exclusive issue of Turning Points is filled with inspiring daily devotionals and 3-5 new articles from Dr. David Jeremiah. You can enjoy the same inspiring devotionals from David Jeremiah’s daily emails in a beautiful thematic magazine each month. Join the community of nearly 300,000 friends who are building their faith each month with this free devotional magazine. From Dr. David Jeremiah, pastor, best-selling author, and the host of Turning Point Radio's 8,700 daily broadcasts, plus a weekly television audience of more than 2.9 million people. God has used Turning Point to expand my knowledge of the Bible through the magazine. The teaching seems to come just at the moment I need it. It makes me hunger for more of God’s Word. Sometimes I even fall asleep in my Bible because I don't want to stop reading Gods Word. Turning Point has opened a whole new world for me. The Lord has been dealing with me about a habitual sin that I had allowed to come into my life. I knew God’s Word said that I needed to take captive every thought and bring it into obedience to Christ. As I walked through the house one particular morning, my wife had some of your monthly magazines out and there it was on the front cover: “All Thoughts Captive.” The Lord has used that issue to help me and I praise Him first and foremost! I also wanted to let you know He used that issue of Turning Points Magazine to give me what I needed in that moment. I still have that magazine and am planning to hold on to it as a Spiritual Marker in my life as to how God has and continues to work in my life.